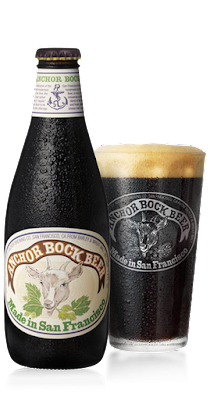 Anchor Bock Beer (5.5%): When spring comes in town and the heat starts rising rapidly there are barely a few weeks to enjoy some spring brews before the summer strikes full force. Bock beer is my all time favorite for these days. It's a dark and doughy style lager, rested longer before bottling, hoppy, with slightly higher abv and perfect to drink cold right out of your refrigerator. Since I have already a soft spot for Anchor Brewing I thought it would be a good idea to try their bock beer released every year around February/March signaling the coming of spring. Look: Opaque chestnut brown, much darker you would expect from a bock beer. A thick and persistent nice looking latte brown head. Nose: Toffee and caramel sweetness with some seriously sour grape molasses and sour, lightly roasted coffee bean aromas. It has a pretty thick feeling more like a porter. Palate: Ok... The mouthfeel is not nearly as thick as the nose suggested, almost watery. Light black coffee, like a diluted americano, bitter-sweet chocolate and caramel. Grape molasses, prunes and other dried dark fruits. Dates maybe. I wouldn't say boring but it is not that much exciting either, mostly one dimensional. Overall: Definitely not I was expecting... It tasted more like a watered down porter which is not a negative comment but I kind of missed the malty, grassy, doughy and refreshing taste of the bock brew. I guess I was prepared to taste a German style bock. Nevertheless it is an incredibly easy drinking beer and fits perfect to the season.